A hand crafted Tiffany light of the highest quality. This clear beaded Tiffany range has to be the jewel of the Nile with it’s warm desert sand coloured wash that glows with sun rays when illuminated. With cool clear glass jewels separating each individual piece of Tiffany glass. 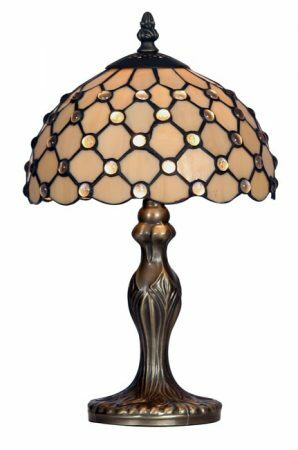 A lovely hand made 200mm diameter (8 inch) Tiffany table lamp with an antique brass finish that will grace any table top. Part of the Jewel range of Tiffany lamps. Hi Jodie, many thanks for your question. This base is made from zinc alloy. Kindest Regards John.